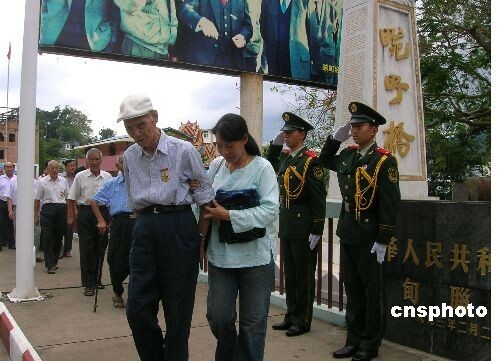 The distance from Myanmar to the Chinese border village of Wanding, Ruili City, in Yunnan Province is not that far, but it took nine former Chinese soldiers almost seven decades to make the journey. The soldiers were members of the Chinese Expeditionary Force and went to Myanmar to fight the Japanese in World War II. Sixty-seven years later, they returned home. The Ruili city government held a special ceremony to welcome them back to their homeland on May 30, 2009. When the nine elderly men crossed the Wanding Bridge, the border between China and Myanmar, some of them couldn’t help but cry. 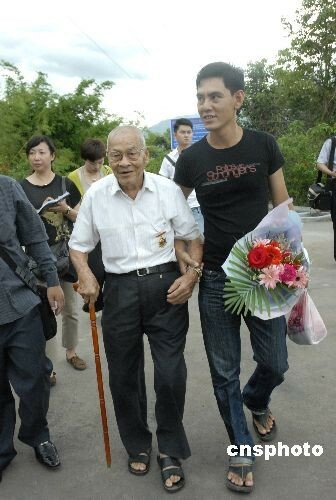 Cai Zibin, one of the soldiers' former comrades, settled in Wanding village and came to the bridge with his military medals to greet his old friends. After the ceremony, the soldiers strolled through Wanding village and Ruili to see how China has changed since they’ve been gone. Local residents presented them with flowers to welcome them back. The nine former soldiers are from the provinces of Sichuan, Shandong, Guangdong, Hunan, Jiangsu and Henan. The youngest soldier is over 80-years-old. During World War II, Wanding was an important logistics center for the allied forces of China – Britain and America because the Japanese army had blocked Chinese seaways. Wanding was also a significant border village where thousands of soldiers in the Chinese Expeditionary Force crossed through to leave and enter China. After they lost the war, most soldiers retreated, but some stayed in Myanmar for various reasons.